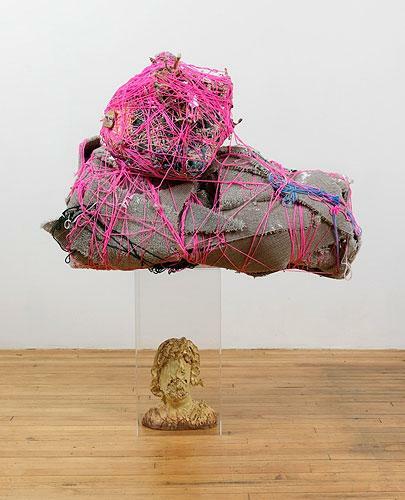 Base:Object brings together five new sculptures which explore the status of the pedestal in contemporary art. 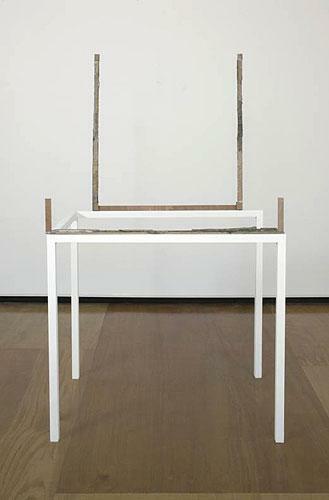 Strictly as a tool to present a sculpture, to clarify what is and what is not an art object, and to signify the importance of what is being displayed, the pedestal has been undermined in modern art history since Constantin Brancusi's sculptures in the earliest decades of the 20th century. All of the works in the exhibition subversively complicate the duality of the pedestal/art object relationship and unlike Minimalist sculpture from the 1960s, choose to work with and through the form of the pedestal without completely obliterating it. The pedestal can act as a kind of barrier between art and non-art, simultaneously anointing the displayed and effacing itself. When the pedestal becomes the art object, these hierarchies are crushed into a shimmering sea of infinite difference. Do you know how diamonds get to us? Three hundred miles underground are heats and pressures that crush carbon into sparkling shapes, driven for months or days or hours along hotel corridors called diamond pipes until they erupt in a pile of taffeta and chocolate some moonlit afternoon, an event no human has ever witnessed. 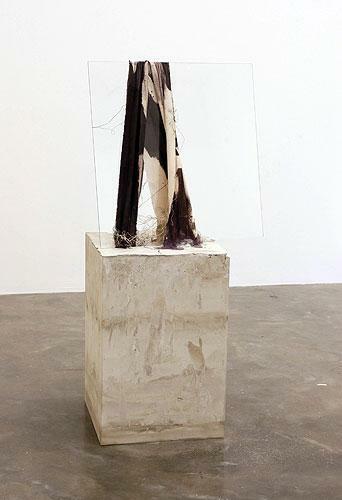 The sculptures in Base:Object figure fragility and precariousness, constriction, binding, and fracturing. Surfaces are rough and raw and scarred. These works are experiments to set meaning in motion. These sculptures deny the autonomy of the art object and yet celebrate the motivations and compulsions to make art. The works in this exhibition and by this generation of artists short circuit the embedded ideologies of presentation and recast traditional signs of importance and value. This subversion is made manifest by working a kind of alchemy on the detritus and cheap materials overlooked in a society of consumption. All of the works in Base:Object display a marked interest in materiality and the painstaking effort of creating an object both seemingly casual and formally rigorous. Eschewing bronze, porcelain, and carved wood, the works in Base:Object are constructed from the everyday materials of the urban world: concrete, Formica, urethane, nylon yarn, canvas, carpet, sheets of glass, bits of wood, foam, drywall. They are the children of Minimalist boxes, no longer simply reflecting the viewers gaze back into the world at large, but displaying their origins in that world. It's the Minimalist cube or the Rauschenberg combine infected by the desires and conditions of the society that bore them. Barker, Hill, Monahan, O'Brien, and Ruby are all working contemporaneously in a time of uncertainty, war, gross economic inequity, financial collapse, and unprecedented environmental destruction. Heats and pressures erupting form-possibilities of renewal built from the ruins of the present. 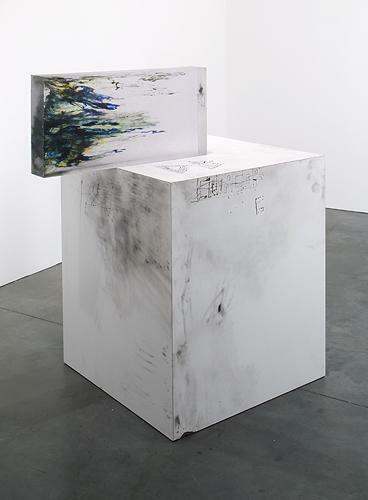 For press information please contact Jeremy Lawson at j.lawson@rosengallery.com.